Crusaders of light is today’s featured game. Learn more about what the game is, what makes it special and why they should win the Grand Prix this year! Crusaders of Light is a fully-fledged MMORPG for mobile, and the first mobile game to feature 40-person raids. Set in a massive 3D fantasy world where players can experience over 300 hours of available gameplay, Crusaders of Light bands adventurers together with their friends in real-time to beat epic bosses and unlock legendary gear. Those who enjoy cooperative play can engage in ranked 1v1, 3v3, and 5v5 PvP arena battles, while sharpening their skills in 40v40 battleground fights. Players can choose from among five character classes, each with their own paths, skills, and runes to best equip them for the job at hand. Guildmates can also take advantage of the game’s Integrated Voice System as they climb the ranks by battling other guilds for glory and work together to enlarge their territory. As a truly cross-platform game, Crusaders of Light lets you continue your adventure with the same character whether you’re on iOS, Android, Facebook Gameroom or, starting in March, on Steam. Crusaders of Light was the first MMO to successfully bring 40-person raids to mobile. Being a massive multiplayer game, Crusaders of Light has many ways players can play with or against each other. Players can join guilds of up to 200 players, take on terrifying bosses and collect loot. In addition to offering 1v1, 3v3, or 5v5 arena battles that pit players against each other in a pure test of combat skill, the game features a battle royale-style mode, Windwhisper Survival.With chat functions that let players communicate with their party, guild or the whole world, Crusaders of Light encourages players to join in on the adventure with friends and forge new bonds along the way. Crusaders of Light is a mobile and PC cross-platform MMO, allowing players to play where they want, when they want — and switch seamlessly between devices using their same character. Crusaders of Light sets the adventure free and lets players play the way they like, whether at home or on the go. 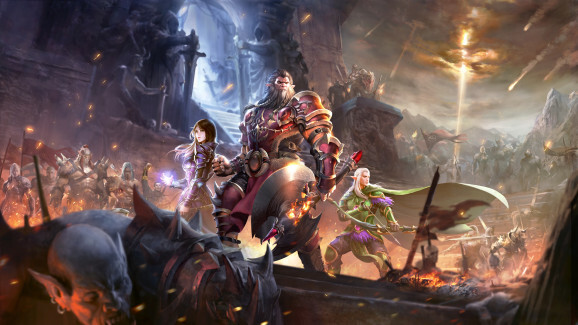 By combining all the deep customization and adventure of the more traditional PC MMORPGs with the social and spontaneous nature of mobile, Crusaders of Light distinguishes itself as the one of the most accessible and immersive free-to-play MMO mobile games available. As the first mobile game to successfully bring 40-person raids to mobile platforms — along with the PC-quality graphics, a gorgeous open world– it has proven itself a strong contender for the Grand Prix. Additionally, Crusaders of Light was nominated one of Facebook’s 2017 Best Free-to-Play Gameroom Games of the Year. Do you like what you read? Don’t hesitate to vote for the game you like the most!